About: The Drapers Arms serve a variety of Modern British dishes as well as a range of beers and spirits. "A cosy all-rounder that its locals should feel thankful for"
When you want to avoid the same old Upper Street haunts, head for the Islington backstreets, the land of media execs and politicians, where local pubs do it with panache. But what is ‘it’? Well, maybe ‘it’ is the gastro menu, the well thought out drinks menu or the carefully designed décor of heavy rustic furniture and neutral shades. Maybe ‘it’ is all of that? Located north of Angel, The Draper’s Arms is an immaculate fit for the area. In a neighbourhood where a large percentage of the houses probably cost upward of a cool million pounds, the pub fits in seamlessly. 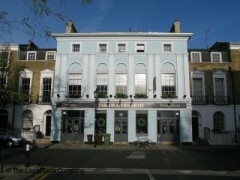 As well as attracting the well-heeled locals the pub also has enough about it to rope the public in from further afield. All very ‘nice’, it’s the type of pub that appeals to families and bank holiday board-gamers with its focus on good wine and fine food. The wine list we can back and there is also a mixed list of beers on draught – including your classic craft offerings. Having only snacked on scotch eggs and the excellent Sunday roast, we can’t commit fully to giving the menu the whole five stars but if the evening menu is as good as that most traditional of English lunches, you’re in safe hands. At Christmas the Draper’s Arms embraces the season with an annual carol singing evening (for all those who can separate themselves from their cynical side for an evening) and we can’t think of a pub north of Upper Street that is quite as cosy. A pretty all-rounder that its locals should be thankful for.